If you are a food blog reader or a cookbook addict, then you already know that Yotam Ottolenghi's new cookbook JERUSALEM is a mega hit. I like it even better than his book PLENTY, if that's possible. I know nothing about Middle Eastern cuisine, except the few times I have had it (mostly at Lebanese places), I have loved every bite. Lots of lentils, chickpeas, rice, lamb, sumac, sesame and other earthy flavors, make this cuisine delicious and rich, yet healthy. It's not a book about Israel or kosher foods at all, so forget that notion. Mr. Ottolenghi owns a few wildly successful restaurants in London and is of Jewish Israeli (Italian father) descent, his partner Sami Tamimi is Palestinian, from East Jerusalem. These recipes are from all over Jerusalem, some of them Sami's mother, some of them Yotam's mother's (who is of German descent). Go figure, an Israeli Jew and a Palestinian working and living in harmony. Of course, it's always food that brings everyone together. 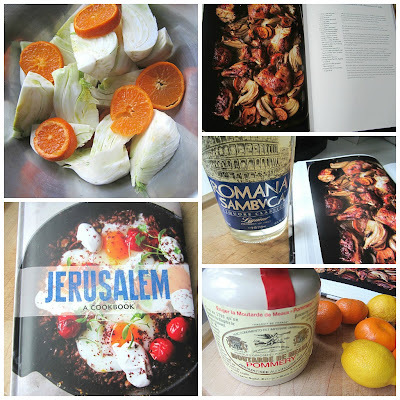 I want to make everything in this book, but I started with the Roasted Chicken w/ Arak and Clementines, though I had no idea what "arak" was. Arak is a liquor, with an anise flavor sold in most Middle Eastern neighborhoods, however, I could not find any, so the author suggests Pernod (French), or Ouzo (Greek) as a substitute. Well, I had Sambuca (Italian) in the house, probably a little sweeter than Arak, but that is what I used and it came out delicious. This is the perfect dinner party dish and one of the most delicious ways to prepare otherwise boring chicken. 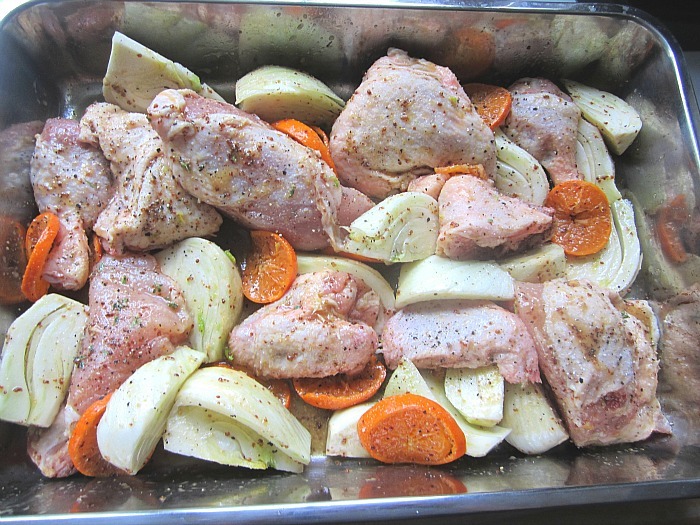 You can assemble it all the day before and let the flavors marinate overnight, then just roast before serving. 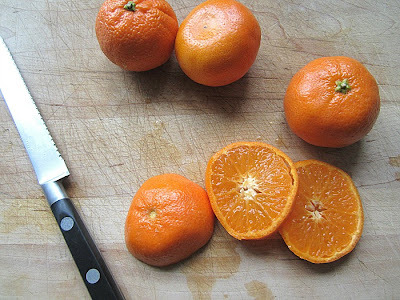 The clementines and fennel get nice and caramelized and the liquor burns off, and just leaves a faint hint of anise. Amazing stuff. I served this dish w/ the basmati rice, chickpeas, currants and herbs from the book. I think I will make this for Rosh Hashanah or Passover, it just reminds me of holiday time. Everyone loved it on a Sunday night in December. *If you are on my holiday gift list, you will probably be receiving this book for Christmas, so the cats out of the bag. In a large bowl, add the sliced clementines with the chicken pieces and the fennel. Let marinate a minimum of 4 hours, or overnight. The longer the chicken sits, the better it is. 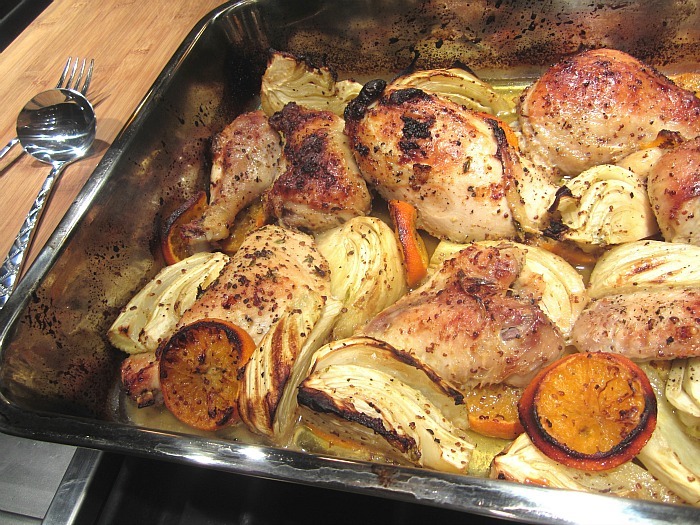 Just before serving, heat the oven to 475F and roast the chicken for 35-45 minutes. Remove the solids in the pan to a serving platter, and boil the remaining marinade in the pan until it is reduced (I skipped this part, and just spooned the liquid over the chicken pieces on the plates). Pour over the chicken and garnish with freshly chopped parsley. i have this book and it is "unreal" .... everything i have made from it is beautiful , tasty and such simple and authentic ingredients .... i still like their book " plenty" - it has a different feel . I have this book on reserve at the library, but I'm sure once I see it, it will be on my "want" list. Lucky for those folks on your gift list. The recipes in his last two cookbooks are so delicious and different from my normal repertoire. I loved everything I ate at his restaurant in London - and anything with fennel always interests me. I feel that way about Plenty, I could eat everything in that book, I have to dig into this one now! Your dish looks and sounds amazing! 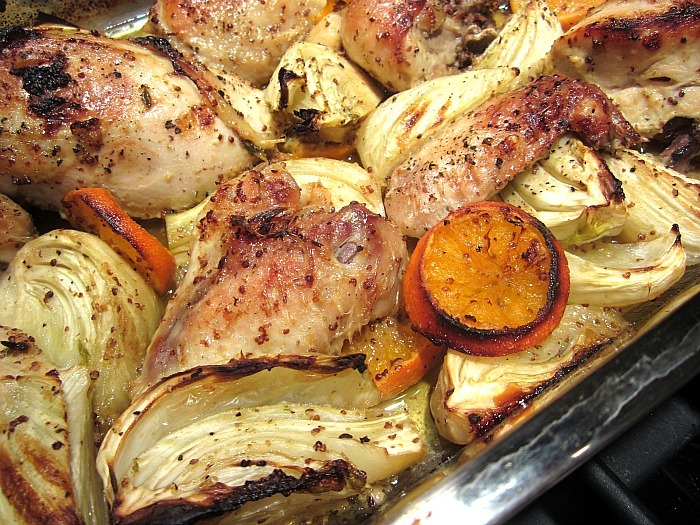 that is fennel, not artichokes paired with the clementines and chicken. It was delicious! I don't have his new book yet (Santa, are you listening? ), but I do have some ARAK in the basement...consider this one made! Awesome. I am definately trying this recipe. Thank you for sharing. This is a beautiful book. I purchased Plenty right before Jerusalem came out and then purchased it right away. Looking for recommendations from both books-- as must make recipes. Thank you and happy holidays!